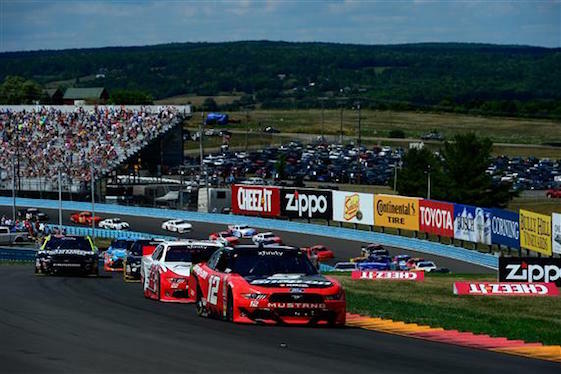 Thanks to Joey Logano, Team Penske’s season-long futility streak in the Xfinity Series came to an end Saturday at the Watkins Glen International road course. Logano started on pole, led 67 of 82 laps, got a big break when Team Penske teammate Brad Keselowski broke a track bar while challenging Logano for the lead late in the race and then easily cruised en route to getting his team its first victory of 2016. “It was awesome for this 12 team to come together,” Logano said. “It is a bunch of guys and girls we put together at the shop to have some fun and we come up here to Watkins Glen and it is a lot of fun to win at this racetrack. Logano will start Sunday’s Sprint Cup race P7. Keselowski was all over Logano as the second half of the race wore on and actually appeared to have a faster Ford. But the pounding the stock cars take as they bounce over and on The Glen’s treacherous curbs took a toll. Coming out of the “Bus Stop” at the 2.47-mile track, Keselowski’s car broke and the rear end shifted out of place. (1) Joey Logano(i), Ford, 82. (3) Paul Menard(i), Chevrolet, 82. (4) Kyle Larson(i), Chevrolet, 82. (6) Daniel Suarez, Toyota, 82. (7) Trevor Bayne(i), Ford, 82. (10) Elliott Sadler, Chevrolet, 82. (9) Justin Allgaier, Chevrolet, 82. (12) Brendan Gaughan, Chevrolet, 82. (19) Ryan Reed, Ford, 82. (16) Brennan Poole #, Chevrolet, 82. (8) Ty Dillon, Chevrolet, 82. (13) Erik Jones #, Toyota, 82. (22) Brandon Jones #, Chevrolet, 82. (18) Ross Chastain, Chevrolet, 82. (20) JJ Yeley, Toyota, 82. (17) Scott Heckert, Ford, 82. (23) Kenny Habul, Chevrolet, 82. (28) Dakoda Armstrong, Toyota, 81. (31) Stanton Barrett, Dodge, 81. (33) Ray Black Jr #, Chevrolet, 81. (35) Cody Ware #, Chevrolet, 81. (24) Spencer Gallagher(i), Chevrolet, 81. (25) Ryan Sieg, Chevrolet, 80. (2) Brad Keselowski(i), Ford, 79. (15) Jeremy Clements, Chevrolet, 74. (39) BJ McLeod #, Ford, 73. (21) Ryan Preece #, Chevrolet, Suspension, 67. (36) Nicolas Hammann, Dodge, Oil Leak, 67. (11) Darrell Wallace Jr, Ford, 63. (38) Ryan Ellis, Chevrolet, 62. (40) Derrike Cope, Chevrolet, Accident, 53. (37) Joey Gase, Chevrolet, Transmission, 32. (30) Jeff Green, Toyota, Fuel Pump, 18. (26) Todd Bodine, Chevrolet, Accident, 17. (14) Blake Koch, Chevrolet, Accident, 17. (29) Tomy Drissi, Toyota, Accident, 17. (5) Kyle Busch(i), Toyota, Accident, 17. (32) TJ Bell, Chevrolet, Transmission, 13. (27) Garrett Smithley #, Chevrolet, Overheating, 13. (34) Chris Cook, Dodge, Suspension, 8. Average Speed of Race Winner: 87.496 mph. Time of Race: 02 Hrs, 17 Mins, 46 Secs. Margin of Victory: 1.517 Seconds. Lap Leaders: J. Logano(i) 1-16; D. Suarez 17-18; T. Dillon 19-23; J. Logano(i) 24-47; K. Larson(i) 48-49; D. Suarez 50; R. Chastain 51-52; D. Suarez 53-55; J. Logano(i) 56-82. Leaders Summary (Driver, Times Lead, Laps Led): J. Logano(i) 3 times for 67 laps; D. Suarez 3 times for 6 laps; T. Dillon 1 time for 5 laps; R. Chastain 1 time for 2 laps; K. Larson(i) 1 time for 2 laps. Top 10 in Points: E. Sadler – 668; D. Suarez – 657; T. Dillon – 629; E. Jones # – 613; J. Allgaier – 610; B. Gaughan – 598; B. Poole # – 587; B. Jones # – 573; D. Wallace Jr – 512; R. Reed – 496.